Class that defines how to read GE4 file format. Definition at line 49 of file itkGE4ImageIO.h. Definition at line 63 of file itkIPLCommonImageIO.h. Definition at line 64 of file itkIPLCommonImageIO.h. Definition at line 55 of file itkGE4ImageIO.h. Definition at line 58 of file itkIPLCommonImageIO.h. Definition at line 60 of file itkIPLCommonImageIO.h. Definition at line 62 of file itkIPLCommonImageIO.h. Definition at line 56 of file itkIPLCommonImageIO.h. Definition at line 53 of file itkGE4ImageIO.h. Definition at line 54 of file itkGE4ImageIO.h. Definition at line 57 of file itkIPLCommonImageIO.h. Definition at line 59 of file itkIPLCommonImageIO.h. Definition at line 61 of file itkIPLCommonImageIO.h. Definition at line 55 of file itkIPLCommonImageIO.h. Set the spacing and dimension information for the set filename. Writes the data to disk from the memory buffer provided. Make sure that the IORegions has been set properly. Determine if the file can be read with this ImageIO implementation. FileNameToRead The name of the file to test for reading. Returns true if this ImageIO can read the file specified. Definition at line 283 of file itkImageIOBase.h. Definition at line 304 of file itkImageIOBase.h. 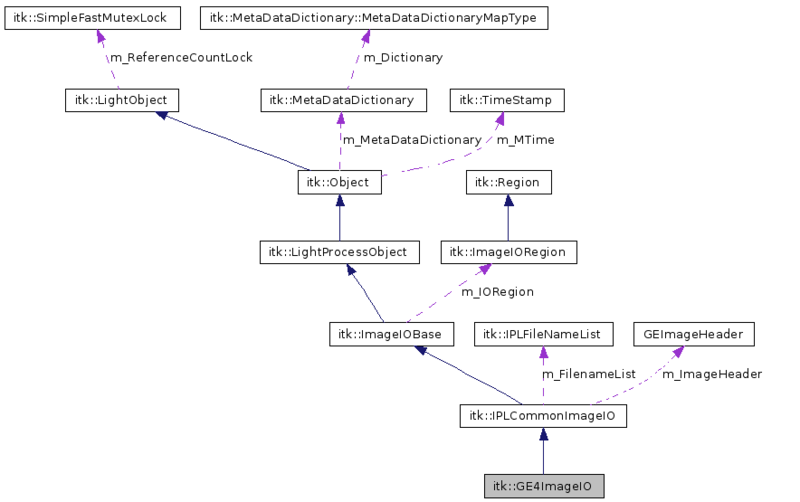 Determine if the file can be written with this ImageIO implementation. FileNameToWrite The name of the file to test for writing. Returns true if this ImageIO can write the file specified. Reimplemented in itk::MetaImageIO, and itk::NiftiImageIO. Compute the size (in bytes) of the components of a pixel. For example, and RGB pixel of unsigned char would have a component size of 1 byte. Get the component type of the pixel. Get the type of the pixel. Definition at line 86 of file itkIPLCommonImageIO.h. Set sorting method by name ascending. Set sorting method by name descending. Reimplemented in itk::MetaImageIO, itk::NrrdImageIO, and itk::RawImageIO< TPixel, VImageDimension >. Definition at line 325 of file itkImageIOBase.h. Definition at line 146 of file itkIPLCommonImageIO.h. Definition at line 144 of file itkIPLCommonImageIO.h. Definition at line 145 of file itkIPLCommonImageIO.h.